Air Brussels is proud to announce that the impactful campaign “THE GOOD DICTATORS” is back stronger than ever with our very special guests, Trump and Erdoğan. At Air Brussels, we are firm believers of personal development. People have their strengths as well as their weakness, and the leaders of this world are no different. That is why we decided to help them out and have them attend our Human Rights 101 with the hope of teaching them a thing or two. 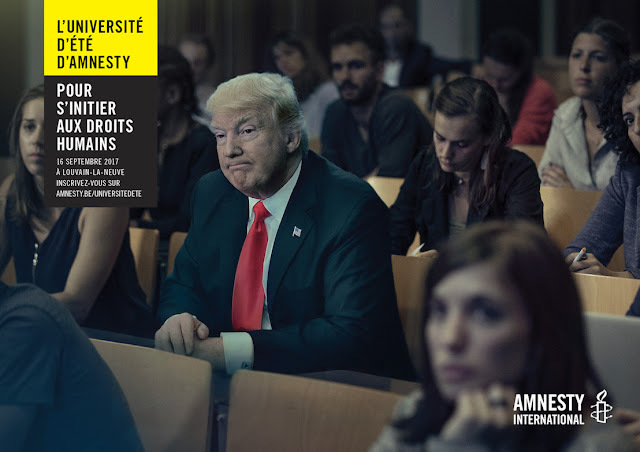 Amnesty asked Air to create prints and online posts that invite people to Amnesty’s Summer University, the year’s biggest assembly of human right activists in Belgium. We came up with a simple yet innovative idea. Having the world’s best dictators attending the lecture hall amongst the other students.